Well recorded vocals can make or break a song. The good news? It’s not really that hard to capture a great vocal recording. In fact there are basically two main steps you need to follow. In today’s video I show you exactly how I follow these two steps to get a great vocal recording for myself and all my clients. Enjoy! Thanks. With what mic did you record “Lower” EP’s vocals and guitars? I used the Rode NT1a for all vocals. A Kel Audio HM2d for guitar amps, and a Kel Audio HM1 for acoustic guitar. I got curious with your mic choice, Graham. What factor/factors made you go with the Rode for vocals, instead of for ex the Kel HM-7U (you still have it, right?). I only ask this because I’m tempted to get the HM-7U for myself so I’m trying to gather as much information as possible. From the samples on their website I’d say don’t get it for vocals. It sounds sterile and uncolored. It sounds great on acoustic guitar thought. Keep in mind I’ve never tried it. The versatility for acoustic guitar was one of the things that made me “curious” about that mic. It’s curious that you felt it sterile and uncolored mate. One thing that jumped to my ears (from the samples) was a certain smooth character (can’t explain it better… sorry) – not nasal and (or) harsh (that sound that pierce your ears/brain/whatever. Still have and use the HM7u. It’s a wonderful mic! i have botching my mixes big time before learned of you tutorial on the net. Good stuff as usual, Graham! Thanks Graham, especially for the “50% on the meter” concept. I’m a swedish singer/songwriter/homestudio recorder. I just want to start off by saying thank for some really great tips. I really like your philosophy in the studio, I’ve already implemented some of that stuff in my mixing. I’m certainly one who’s been recording vox too loud to the point where it’s almost clipping, all to get a good ratio between noise and signal. It would be intresting to hear your view on this. If noise is the problem, you should check where the noise is coming from. 1) from the surroundings? That means you should record in a different place, or treat the room. It can help already to hang up some curtains, we did that for both voice and horns already. Anything to keep reflections low and outside sounds out. 2) from the gear itself? If it’s humming or crackling, start by checking your cables. If they’re all fine, check the mic itself. Make sure there’s no heavy wifi signal in the room, mobiles stay away from the mic. If all that doesn’t solve it, look at the grounding of your gear. Badly grounded gear can give terrible hums. 3) From the software? Depending on which software you use and especially which drivers you use, you might have to make some adjustments to your system. For example, if you have a windows system and you record by plugging in a mic in the mic entrance of your computer, you have to make sure you put the gain right within Windows. Control Panel > Sound > Recording. Then select the mic, and adjust the gains there if necessary, keeping in mind what Graham said. I’ve noticed these gains were so low I couldn’t record anything decent without getting terrible background noise. If you have a solid mic (doesn’t need to be an expensive one), balanced XLR cables and a decent soundcard, you shouldn’t have problems with noise. Fantastic video. Great, simple advice. Awesome stuff as always!! Just wondering, I read somewhere that you should monitor your levels off your interface and not from inside Pro Tools. I recorded bass and monitored the levels from my interface to be half way up though they weren’t the same inside Pro Tools. Does it matter if you monitor on the interface vs, inside your DAW? Will they be the same? I like what you did here! Hi Rob, if by monitor you mean listen to, then you can listen to what you’re recording off your interface, no problem. But if by monitor you mean read how hot you’re recording, you want to check your DAW. What level it shows up in Pro Tools is what matters. Pretty much just use the mic like I do in a live situation. 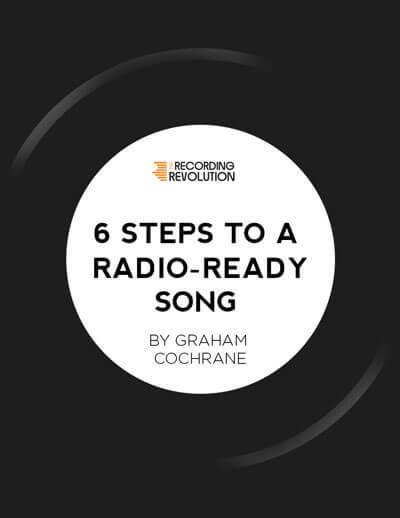 Still, I might just try what Graham says for the next recording and hear the difference myself. Graham, I have a question. Does it matter where I place my pop filter? For instance, you place it halfway to your mouth and the mic, but would it be different if I place it right my mouth? Like you said, the pop filter gives me a sort of “line” I should not across in order to get the sound that I want. Great video and great tips, thanks! Hey Graham, I was wondering if we are doing it U2 style, recording using a dynamic mike like a sure SM 58 for the vocals. Maybe even singing and playing guitar, is there an optimal distance that is best for minimizing proximity, and the square law. A foot away is obviously too far , unless I want to crank the gain on the mic, and then of course it picks up more sounds in the room especially more of the guitar. Any Thoughts? Love The RR Cheers. Don’t assume a foot away is too far. I would actually start there. Move closer if you like the sound of that better. Excellent content as always. I’m wondering how recording vocals might differ if you were recording speaking or dialogue rather than a singing voice. You mentioned the ‘trailer voice’ in your video, where it seems getting closer to the mic makes the voice ‘grander’ in some way. But as far as gain staging in that case, would similar principles apply if the speaking voice tends to be more quiet? For boomy voices, get close. Otherwise do dialog the same way as singing, with a bit of distance. It’ll sound more natural. Thanks for your reply, that should do the trick! Hello Graham, for this video did you make any Eq corrections , and if yes what type? Just for curiosity, it sounds good. Thank for this tips, very cool as your usual. No EQ. What you hear in the video is the mic through the preamp into Pro Tools raw. Hey Graham! This video and videos like it by you are great because the recording end of the spectrum is so important! You’ve got a ton of great videos on mixing which are super fantastic, but I think more recording tips and tricks would be great. You are the RECORDING revolution after all. Anyways thanks for everything you posted past,present and future. Very great points in recording vocals! I had a question about the headphone levels. I see you can turn up the mix in the audio interface but how do you turn just the vocals or guitar in the headphone level? Create a new aux track set its Output to Headphones (obviously, your audio interface must support this option otherwise you can’t do anything! ), put a post-fader send on all the tracks and send them to the aux track you created. Then, you will notice that every track has a volume knob on the send, just play with that knob to set the volume you’ll hear on headphones. I wonder, what should I do with an artist who is used to hold microphone in his hands? He loses his power when singing through the pop or a stand. In the end I decided to use two microphones (stand oktava and sm58 in hand) but unfortunately both came out rather dull and very uneven, the performance was not so bad(better than the same oktava). I think the answer is pretty obvious: What would you want with a good recording of a bad performance? Some performers use the mic like an instrument. That’s how I would treat it in such a situation. Thanks for the reply Patrick. Were both tracks “dull” themselves? I could imagine phasing issues that would be hard to handle in a dynamic performance. It’s a bit unusual for a handheld SM58 to sound dull. It may be not the most brilliant mic in the world, but it’s a well-proven piece of gear. I’d recheck the setup maybe. About the unevenness… a mixture of manual adjustments of the vocals parts, compression, limiting, deessing, digital pop/click filtering and high passing might do the trick. By dull I meant uninteresting (I do love the SM58 sound:D). I didn’t use 2 mics in the mix so no problem with the phase. Well, it was a very energetic and lively performance. I did vocal riding, pops etc. but it was extremely uneven. For me the recording was unpleasant and unnatural. It was a long time ago but still I do not know whether it would be better if the singer tamed with a stand. He didn’t learn to properly maneuver the microphone during the session. Not every musician is a good recording artist. But he can learn and adapt with time, so I’d tell him what is problematic about his habits in the studio afterwards. Hello Graham, great tips as usual, I’m always impressed by your eloquence, haha. I own a home studio down here in Brazil which I invested quite a bit in, and I’ve been learning about the craft of recording for about 4 years. I’m pretty confortable about recording now, I feel like I’ve learned some solid stuff and I’ve already produced a good amount of songs for me and my band, so I’m thinking about marketing my skills. Do you have any tips for getting clients and start working? It won’t be a full time job or anything, I’m a student. Hi Graham, Great video! very well illustrated in the concept of using the two steps or guidelines! Fantastic explanation of the Proximity effect for the new amateur home recording enthusiasts, and kudos on the vocal skills too! During the last ywar i’ve benn working in my home studio project i’ve read almost all of the articles and watched all 5min for a better mix and other videos and they’ve helped me a lot for improving my recordings and mixes. This is the first time i see a video where you show how do you record things and it would be great if you could do other videos showing how do you record guitars, drums, percussions,etc. Soon I will be recording vocals. It will be my first time recording vocals…and they will be my own. So there’s that. Great post and timely for me. I mean, I kinda figured not to sit on top of the mic but I think to be able to see it all together was great to talk not just about distance but adding the the gain staging aspect. Concepts you talk about often but pulling it in to this was very useful for me. My wife (a GREAT voice) said that I have a fairly powerful voice (if a bit untrained…go overdubs!) and think this sets aside that fear that I will be blasting the mic to the sky. That’s what was missing from Rethink Vocals. Thanks a lot. Graham, Do you use the same gain staging level for instruments too (guitar, drums)? I’m guessing you do, but didn’t want to assume this is the case. Hey Graham, I thought I saw a Presonus ADL 600 in your rack on one of the other videos. Wouldn’t any decent mic sound great through that preamp for vocals? Hi Brandon, I just got the ADL 700 recently and have yet to use it. Plan on tracking some drums with it soon. I think any decent mic through any decent pre can sound good. Thanks for another great video Graham – I recommend them a lot on our Mixcraft DAW forum. I normally use a Behringer B1 through a mixer for (1) phantom power and (2) the ability to tweak the EQ before “going in”. My question, should I be checking for that 50 percent level on the mixers meters – controlling it with the trim knob and/or slider – or on the DAW’s track meters? You would CHECK the level in MIxcraft (your DAW) but control the level from the trim plugin on the mixer. As always Graham, great post! In fact I’ve found that a lot of instruments, not only vocals, sound better and more natural if you back the mic of a bit. I really enjoy seeing the meter readings as you recorded the vocals. That’s something I’d love to see more of. Preamp level settings and setup before hitting record. Thanks a million, God bless, and keep up the awesome work. Would you recommend the same technique when micing drums? It just depends on what you’re miking. Gain staging, yes. Distance, it depends. Close up on a snare or tom can make it sound fatter. Farther back on Overheads can give you less cymbals. Etc. Hey man, great video..really informative. I’m a beginning at home recording and looking to buy some equipment…..obviously the stand and pop filter aren’t going to be troublesome, but do you have any specific recommendations for a decently priced audio interface? Also, would that mic be good also for recording acoustic guitar? And one more question, the distance techniques in the video……the way I sing can be pretty big and loud sometimes, I like to belt. Since typically, songs won’t be like that the entire way through and will have some softer parts, some big notes, etc, how to i accommodate that into the recording? Would it just mean stepping further away from the mic, or would I have to stop the recording and lower the preamp? If you want to check out my videos to get a feel for my voice, my youtube channel name is PeytonMcMahonMusic. Check out interfaces from PreSonus or Focusrite. Two great companies with affordable but quality gear. As far as belting, just back up for those parts as needed. The thing is, even though I have my gain at max I still can’t hear the voice very well. Any help for that? Overall like your presentation but i might take issue with your notion that you room is treated. Foam can only do so much. To control a room you need proper MF LF solutions. You can pay big bucks or do the DIY route. Ethan W is pretty much the go to guy on this. Super chunks and other treatments will really help get your room in shape and get strong audio tracks. Keep up the good work. Great video. I was always confused about gain staging. Any advice for mic placement to account for sibilants? Slightly to at an angle or above your mouth. I’ve also heard of people placing a pencil in front of them, before the microphone. Splits the “s” sound. does this rule with the 50% mark only apply to the vocals or would you recommand to record everything at about this level? Because I´m a drummer and I always record any single mic I run into my interface to about just under the 0 db mark. And that´s another question. Is it correct to record everything with the same volume. So for example all my drum mics are recorded with the fader going up to 50% in my DAW or should I even at this stage consider which instrumet will be louder or quiter in the final mix? This applies to everything. If drums are too hot, turn down the gain on your interface or engage the Pad if you have one. A good tip is to put two pop filters together if you like to get closer to the mic for a deeper tone. Some plosive leakage may get through just one pop filter if you stand too close. If you record some close and some not, then find a way to easily detach the second one, but to be honest, I can’t hear the difference even if I leave two together. Just make sure the two are not barely touching, as it might vibrate together, I just used blutac. Great tutorial Graham, you know your stuff! Good advice! Would you recommend recording a bit hotter if I’m recording in 16 bit? I’ve been debating on whether or not I should get a 24 bit interface or not, but I just can’t afford one right now. Is the noise floor a big issue in 16 bit? I wouldn’t record too hot, even on 16 bit. I’ve mixed songs that were tracked on 16 bit and I didn’t even know until half way in. They sounded great. That being said, 24 bit interfaces are super affordable these days, makes sense to get one if you can.